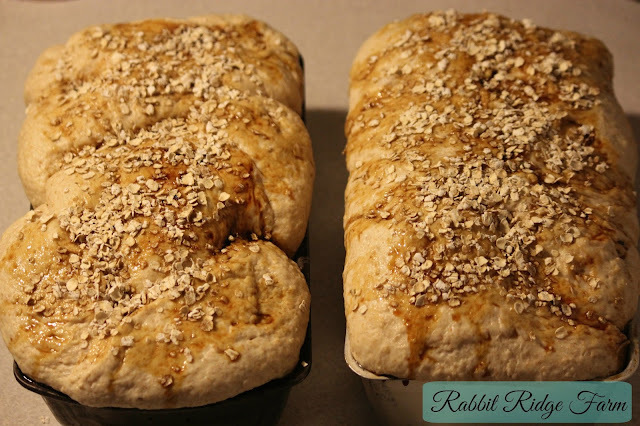 Learning to bake bread was one of my first steps on my homesteading journey. 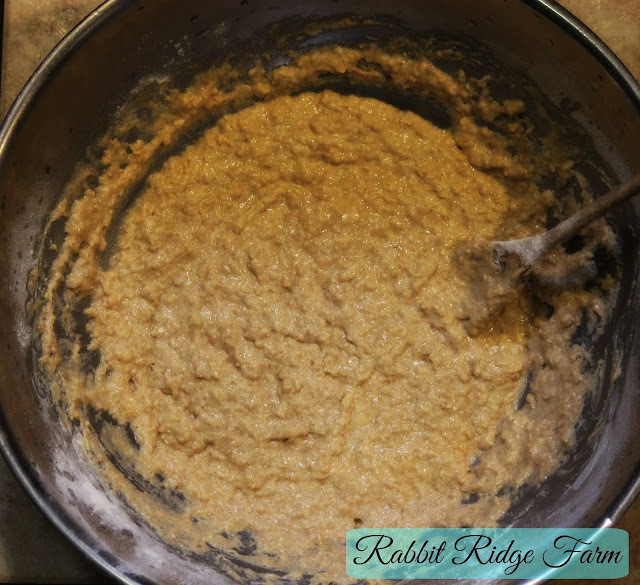 It’s a perfect skill for any homesteader to learn as you can make bread in any kitchen. No need to own acreage, a barn, or livestock but it still manages to give that Little House on the Prairie feel. Ya know? This recipe is my favorite bread. 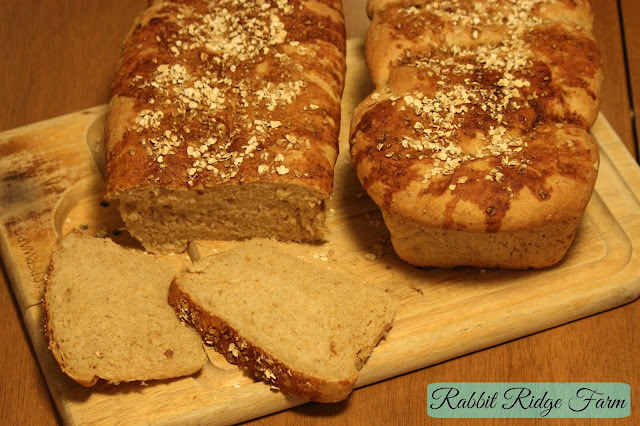 A variation of this recipe was actually the first bread recipe I had any success making and it was so good it became one of our staples. I make a batch at least once a week. I eat toast with my breakfast and Scott loves it for sandwiches. The first step is to activate your yeast. Yeast are actually tiny living organisms but when they’re in a jar in your fridge they’re dormant, kind of taking a long nap. To make bread you need to wake them up. 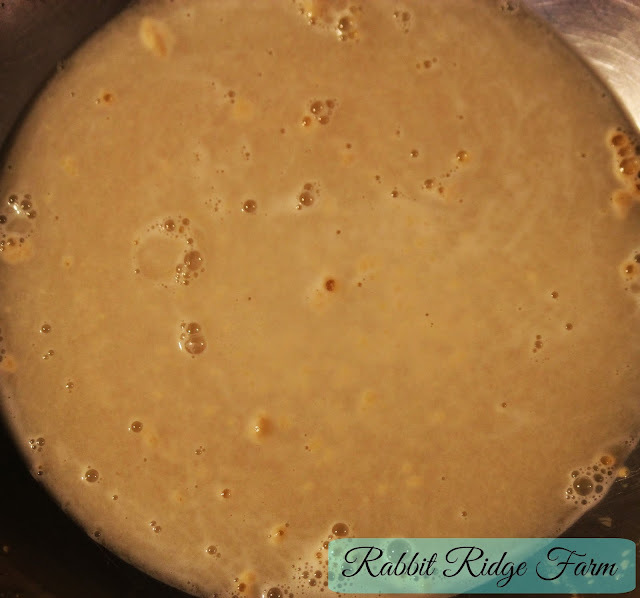 Add the water, sugar, and yeast to a bowl and stir them together. Then let them sit. The warm water wakes the yeast up and they feed on the sugar and produce gases that make the bread rise. After a couple of minutes, add the molasses, oats, vegetable oil, salt, wheat flour, and two cups of the AP flour to the bowl and stir well. 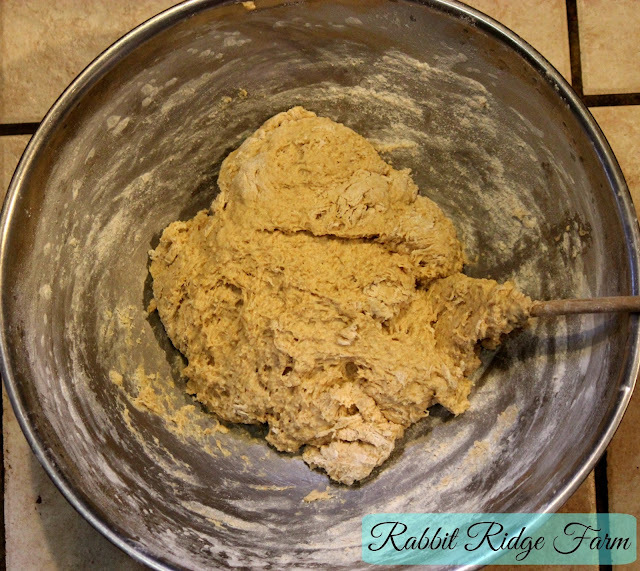 Once there are no dry spots you can begin adding the rest of the flour. I suggesting adding about a cup at a time and then slowing to a half cup when the dough gets harder to stir. 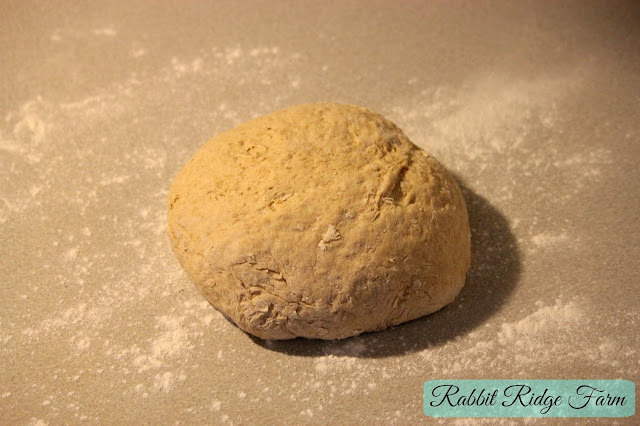 You will notice the dough starts to pull together to form a ball. Dough ball beginning to form. If you find it too difficult to stir you may begin working the dough with your hands. You can turn it out onto a well floured surface. You’ll want to rub flour on your hands as well. You should slowly knead flour into the bread until the dough feels tacky but not sticky. Do not continue to knead once this texture has been reached. Place the dough in a oiled bowl with a damp towel over it and let it rise in a warm place for 1-2 hours or until it has about doubled in size. Then you can shape the loaves. Dough before, during, & after rising. This recipe makes 2 loaves of sandwich type bread but you can use it for rolls or basically any shape you want. 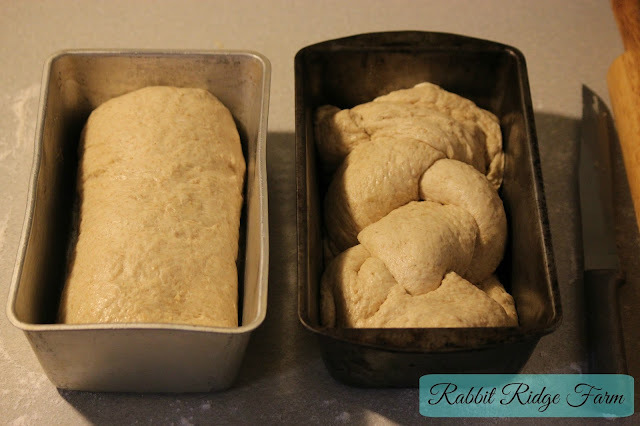 To make sandwich bread cut your dough in half then flatten each half with a rolling pin. This is an important step because it gets any trapped gases out of the dough. If you don’t flatten it you may end up with holes in your loaves. You can make sandwich loaves two different ways, braid them or roll them. 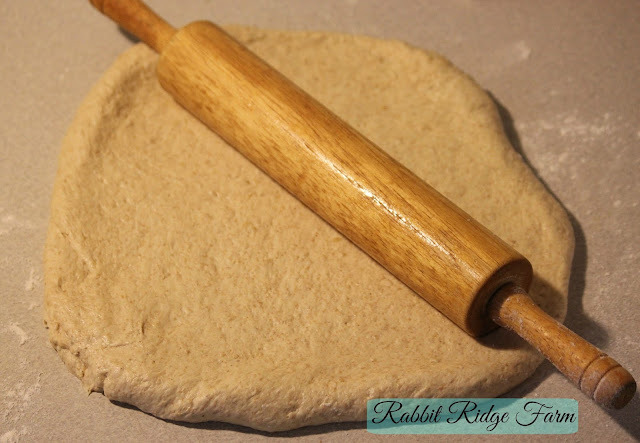 Rolling is simplest just take each flattened piece of dough and roll it up like a sleeping bag and place it in a greased bread pan. 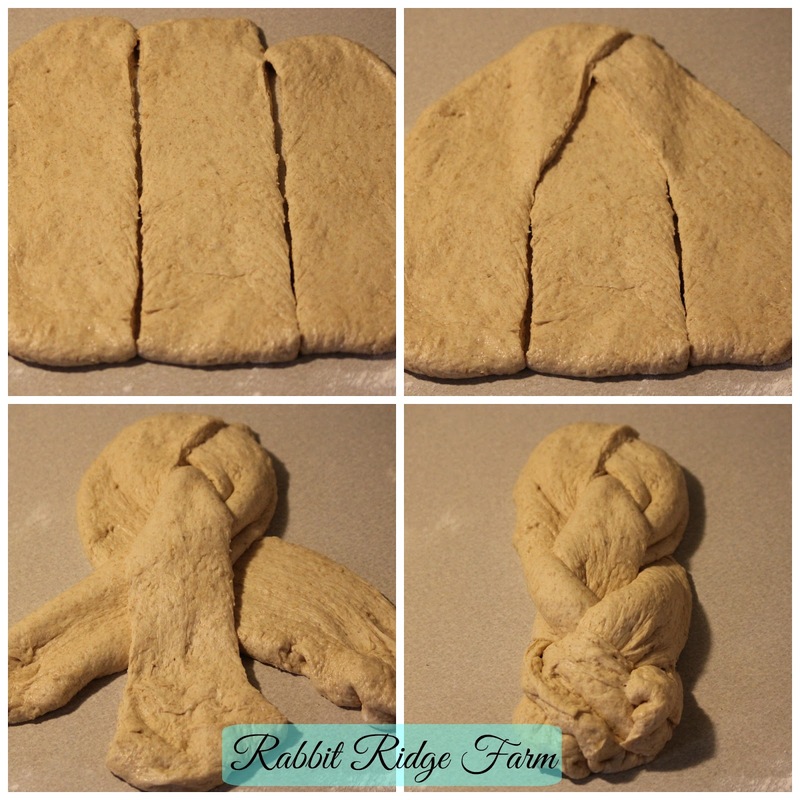 To braid the loaves slice each half into three strips and braid them as you would your hair (put the tops together and keep placing the outside strands over the center, alternating sides). Then place each braid in a greased bread pan. We usually do simple rolled loaves because apparently my pretty braided loaves don’t stand up to Scotty’s sandwich demands. The tops often break when you slice pieces. Oh well. Whatever you decide, its now time to let your bread rise again. Place the loaves back under the towel (you may have to re-wet it at this point). The dough needs to rise again for about 1-2 hours or until it has doubled in size. Your bread is now almost ready to bake! Preheat your oven to 350F. While your waiting gently spread some molasses on the tops of the loaves and sprinkle oatmeal on them. Bake the loaves for 33 minutes and enjoy! If you’re having trouble getting your dough to rise preheat your oven to its lowest temperature (mine is 175 F). Once its preheated turn it off, place your dough in (still in the bowl/pans with a towel over it) and leave the oven door shut for awhile. It should speed up the yeast. You can use either bread flour, AP, or substitute those for more wheat flour however good quality bread flour will give the fluffiest loaf (it contains the most gluten which will help the bread rise) and wheat flour is the heaviest, may not rise as well, and will be the densest loaf. If you’re feeling’ confident feel free to play with the ingredients. We don’t always do molasses and oats and I’ve added things like flax seeds with delicious results! If you’re having trouble coating the loaf in molasses you can heat the molasses a little so it’s thinner an easier to spread. I just set my jar and bread loaves on top of the oven while it’s pre-heating. Fuzzy towels will get fuzz on your dough. You can find a link to towels like I use below. Don’t bag or wrap loaves before they’re cool. Trapped condensation will make the loaves soggy. You may want to leave them on a rack for an hour or so. This post contains affiliate links. I you purchase something I receive a tiny percent at no additional cost to you. It’s just a way I keep this blog afloat! 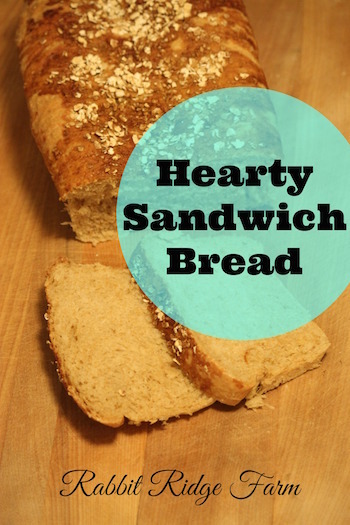 One Response to "Hearty Vegan Sandwich Bread"
And it is so yummy! Mom.